That's My Jellybean! 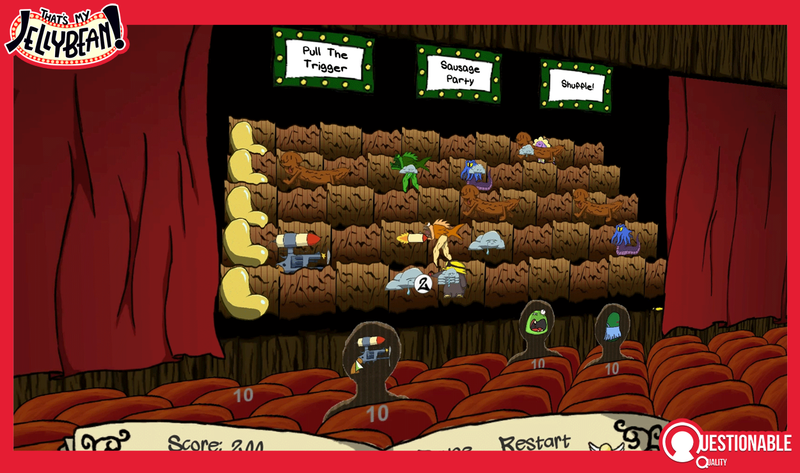 is a Tower Defense Game set in a pop-up theater. You've obtained those sweet sweet Jellybeans that everyone and their fish crave, but it'll be a cold day in hell before you let that them take your spoils. Arm up, strap in, it's gonna get weird. By the end of the day they'll know that That's My Jellybean!. Click on a Turret in the audience and click a point on the grid to defend that row with your Turret. Enemies will start appearing on the rows. DEFEND THOSE JELLYBEANS! Occasionally Improvs will appear from the top of the screen to affect how the game is played. Killing Enemies nets you a higher score and money, which you can use to place more Turrets. Never press the Restart buttons. They don't work. Blame Richard. Press Quit Instead. Shuffle swaps all positions of the enemies. 'I'll Be Back' - When enemies die, they come back as Zombies when the Improv ends. Natural Disaster occasionally a Tile explodes and kills everything on it. Sausage Party summons Sausage Dogs. That's it. They're very cute, but also deadly. Basic Turret: Just fires 6 bullets, then kills itself. Depression Turret: Depresses enemies in its range to slow them down. Absorb Turret: Adds bullets that pass through it to its ammo count. Trap Turret: When an enemy hits him (her? ), an anvil strikes down on any enemy in the tile. Enemies, and their Dastardly Plans! Basic Enemy: Just walks down the row and attacks Turrets. Simple. Fish On Land: Does nothing...THEN TURNS INTO A GIANT FISH WITH LEGS THAT WRECKS SHOP! Moleman: Cowardly burrows to another row when he gets too hurt. Hydra: Splits into two mini Hydras on other rows when he dies. 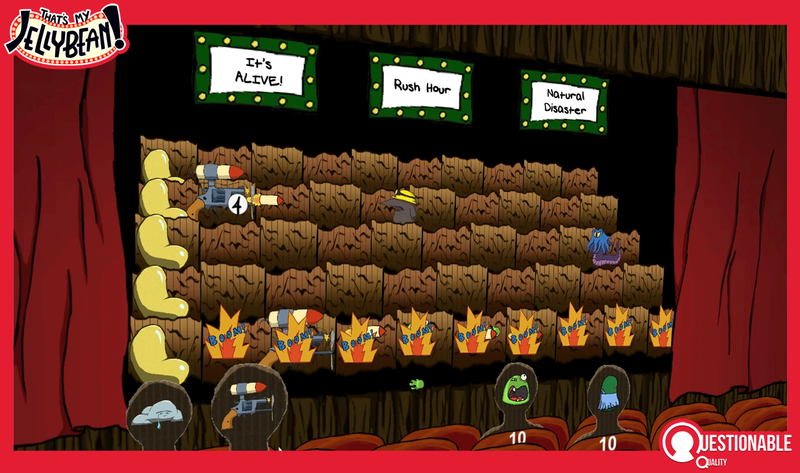 Ticking Bomb: When he takes damage, he prepares to EXPLODE the entire row!. Take him out quick! Your game has potential. It needs some more in-game info. I admire hard work in the gym.